Multi-award winning Gospel musician Joyce Blessing last Saturday, 23rd March, 2019 proved to patrons she is a maharishi when ministration and stage artistry are made the topic of confabulation after she mounted the TV3 Music Music stage to thrill patrons. The mother of three (3) who was all donned in a military raiment lighted up the stage with a super energetic performance as she let flow a miscellany of her songs to bless her fans. Joyce Blessing performed her hit singles ; Repent, I swerve You, Heavy Price, Nyame Aguamma and Monko Moakyi and patrons were full of joys of spring as the gospel musician left the stage. 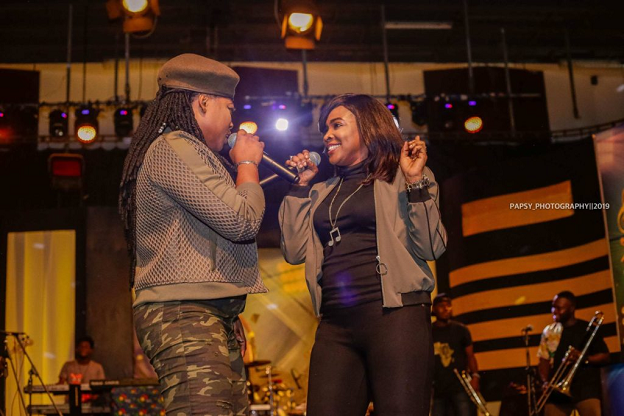 Joyce Blessing performed alongside her protégé Jayana which she recently signed to her record label, Dave Joy Productions. Other artistes who also performed include veteran gospel artiste Mary Ghansah and Too Loaded hitmaker Emelia Arthur . Music Music is a weekly entertainment centered event organized by TV3 to entertain music lovers.